Can I take an OTC cold remedy while pregnant? Q: I'm eight weeks along in my pregnancy and have a cold. Can I take an over-the-counter remedy? A: Probably, but check with your doctor or another expert first. "The data suggest that the ingredients in the majority of cold medications are safe during pregnancy," says Myla Moretti, M.Sc., president of the Organization of Teratology Information Specialists (OTIS). "Still, people sometimes take the wrong medications or the wrong amount for their symptoms. 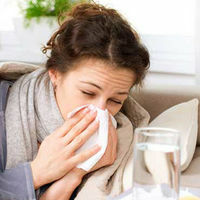 " If your cold is accompanied by a fever, that definitely warrants a call to your doctor to rule out a more serious illness, such as the flu, and to get immediate treatment, Moretti says. "Fever in early pregnancy is associated with NTDs [neural-tube defects], such as spina bifida," she explains. Because these defects occur at around 6 weeks—often before a woman even knows she's pregnant—Moretti says it's important for all women of childbearing age to treat a fever promptly. (Acetaminophen is safe and effective.) "It is important to treat all illnesses during pregnancy," she adds. "Sometimes women feel that not taking something is the safer route, but that's not always the case. " To learn what's a safe remedy and what isn't, call the OTIS hotline at 866-626-6847 or visit otispregnancy.org.